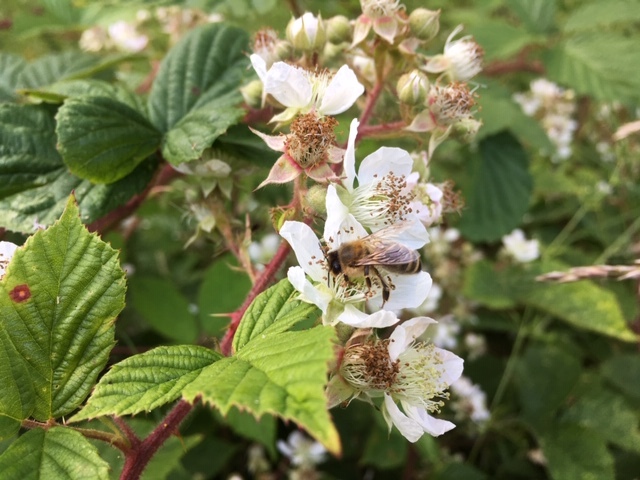 2018 was an amazing year for Victor’s bees at Modern One and the Kitchen Garden at Lasswade! When I last wrote here, I was delighted to let you know that both of Victor’s colonies from the autumn of 2017 had survived the winter and were expanding well. As the weather improved during May and early June of last year, Victor and I added supers above the brood boxes to give the colonies more space to grow and help delay swarming. In a strong colony at the height of summer, a queen honey bee can lay up to 2,000 eggs a day, and so it’s important to ensure the bees have plenty of space in the hive. This is not just for the expanding brood nest, but also for storing honey and pollen. Beekeepers usually place a “queen excluder” between the brood box and the super to ensure the queen doesn’t go into the honey storage area and lay eggs there. As our wonderful summer progressed and the weather became even warmer, both of Victor’s colonies decided it was time to form new colonies and prepare to swarm. Fortunately, there are usually a number of tell-tale signs a week or two before a colony of bees decides to swarm and if the beekeeper is looking out for these (and not on a two week holiday! ), it’s usually possible to persuade the bees to stay. Beekeepers have developed several methods to prevent a swarm leaving the hive. Unfortunately, none of these are foolproof, but most of them will make a difference. This year Victor and I decided we would use the “artificial swarm” method. During the spring, as the colonies were expanding, we placed a spare hive with frames of beeswax (but no bees) at both apiaries in preparation. On my weekly visits to check the bees from April until the end of the summer, I’m looking out for five different things: to make sure the bees have food, the queen is laying and that she has plenty of space for this, any signs of disease and any signs of swarming. The most obvious sign of swarming is when the bees start to build queen cells. Before a colony swarms with its mated queen, it prepares the smaller colony it is leaving behind so that it is “viable”. In other words, there will be enough food for the colony and queen cells to produce at least one virgin queen. Eight days after an egg is laid in a queen cell and the nurse bees have finished feeding the developing larva inside this, other nurse bees will cap the cell with a thin wax cover to allow the larva to metamorphose into a virgin queen. Once the first queen cell is capped, about a half to two thirds of the bees in the colony are ready to swarm with their original mated queen. All they are waiting for is a bright sunny day and we had plenty of these last summer! Fortunately, I spotted the queen cells before they were capped and, with the spare hive in place, was able to use this to house the mated queen and the foraging bees at the original site and move the old brood box with queen cells and nurse bees a few feet away. As everyone knows, there must be only one queen in a colony, but what about all of these queen cells? A week later, I returned to check through the hive with the queen cells and selected just a single one, removing the rest. The virgin queens from both of Victor’s colonies emerged, mated and returned safely to their respective colonies to start laying. So from two colonies, Victor now has four. Actually, he has five, because the colony of the original queen at the Kitchen Garden decided to swarm again later in the summer, but we managed in the same way, to persuade them not to leave. Usually, beekeepers who are keen to bring in a good harvest of honey, will later unite the artificial swarm with the original colony, culling the old queen and keeping the new one. The large, united colony will produce more honey than two smaller colonies. However, this year Victor and I were keen to expand the number of colonies in the hope of bringing in more honey in future years. We were surprised and delighted that the bees not only created new colonies, but also produced a good amount of honey. The bees at the Kitchen Garden Apiary produced over 22kg of honey (about 50 lbs) and the bees at Modern One produced around 18kg plus two supers of “cut comb” honey. 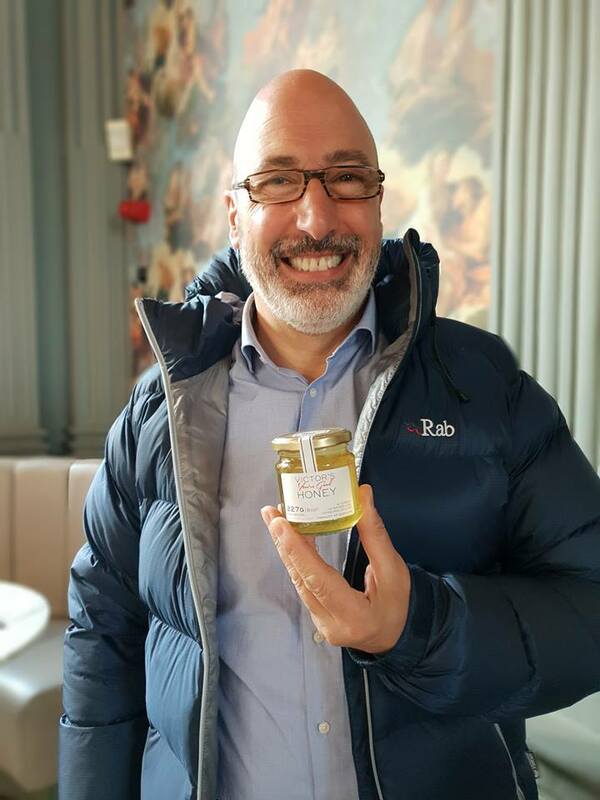 The cut comb honey is honey on unwired comb which is used by the chefs in the Cannonball and Contini George Street restaurants to prepare truly delicious dishes! After a wonderful summer and autumn, Victor’s bees have settled down for the winter now. We’ve checked all five colonies have a laying queen, plenty of stores and are good and healthy. 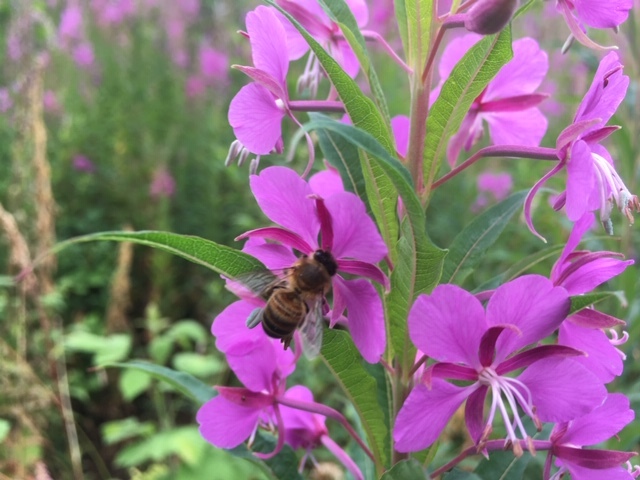 Until the spring and the beginning of the next active season, let’s enjoy the amazing harvest from these hard working bees!